Devotional – Is Jesus Really That Big? January’s picture fascinates me. It depicts two huge, nearly invisible hands surrounding the Milky Way Galaxy. God’s hands. “Teacher! Is Jesus really that big? !” They pointed to a poster hanging just above the chalkboard that they’d somehow just noticed. I found myself caught between giving an adult explanation and protecting their childish wonder. An adult finds the symbolism in this picture, but often takes it for granted. 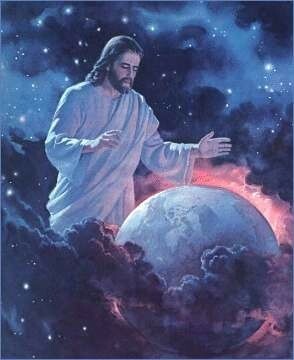 When kids see this picture, however, they see a Jesus who is literally bigger than Earth. Their hearts expand, their eyes widen, their smiles grow. They laugh and imagine and talk about Him in worshipful wonder. I couldn’t take that away from them because something changes when you realize God is truly bigger than your world, bigger than the Milky Way, and yet you know He sees you, knows you, and loves you deeply. I don’t think I can explain that any better than those 2nd graders, but I hope it changes your perspective the way it’s changed mine. Today, may the problems and fears of this world grow smaller as our vision of Jesus grows larger. Once or twice a month, we send out a short devotional to our volunteers. This was written by Andrea Keele, and was sent to our volunteers on Jan. 24, 2017.